At ON we are proud to know that we are one of the few sports nutrition companies who own and operate their own production facilities. While it's true that ON is one of the world's largest producers of sports nutrition products, we remain focused on being recognized as the best. In fact, our requirements for raw materials are so strenuous that it's not unusual for ON Quality Assurance Technicians to reject entire truckloads of raw materials that do not meet our high standards. We like to think that we take as much pride and care in crafting our award-winning supplements as our consumers do with crafting their physiques and fitness accomplishments. There are times when you want a hefty dose of caffeine for pre-workout performance. But on other occasions, like first thing in the morning or a late afternoon pick-me-up, what you’d get from a cup of coffee is more appropriate. 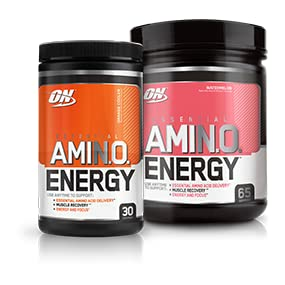 ON’s Essential Amino Energy offers the best of both with a formula that delivers 100mg of caffeine from natural sources per 2-scoop serving. Decrease or increase the energy level as the occasion demands. Each serving provides 5 grams of micronized amino acids for muscle support. Supports Energy & Focus Any Time of Day. Dial Up Strength By Adding More Scoops. Supports Recovery Before, During & After Exercise. 5 to 10 Calories Per Serving. Mixes Easily Into Cold Water.